The Cape Wind project, which would place 130 turbines about 4.7 miles off upscale Cape Cod, would provide "greater public benefit than detriment," the state review found. Rogers said Cape Wind expects the permitting process to be complete by March. For some people, wind farms are visionary and without question a cost effective renewable energy source. For others, they are viewed as unreliable subsidised electricity generators and of course they’re an anathema for those sensitive to visual impact in the landscape. So how is it that renewable energy solutions like this are gaining traction and acceptance by governments, financial institutions, owners and consumers? What sort of commitment and investment is required to ensure wind farms are a long-term viable renewable energy proposition? And what will be the knock-on effect for manufacturers and suppliers to the renewable energy marketplace? Europe has already committed itself to a binding target to supply 20% of its energy needs by 2020 with renewables. The UK government translates this figure into a goal of constructing 45 gigawatts (GW) of wind power by 20201. Of the 45GW target about 12-15GW is likely to be installed on land and about 30-33GW in the waters surrounding the UK. These offshore wind power stations consist of individual wind turbines ranging in capacity from 2megawatts(MW) with a rotor diameter of 80 metres (installed a couple of years ago) to 10MW units with a rotor diameter of up to 150 metres which are expected to be installed towards the later stages of the next decade. Each future individual wind power station is likely to have a total installed capacity between 100MW and more than 1GW, with clusters possibly up to 10GW in size. This UK and European goal is enormous! To put this in perspective, the UK currently has a total installed wind power capacity of about 2.5 GW. 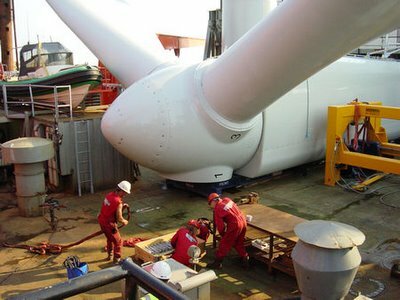 The offshore component (33GW) will have a significant effect on the manufacturing capacities of turbine and blade suppliers. These wind power stations could well be installed in waters up to 100 metres in depth (although the majority is expected to be installed in waters less than 30 metres deep), which will require new installation technologies using specially designed vehicles/boats/jack-up platforms and new and advanced foundation designs (mono-piles, tripods, suction cups etc). In addition, to maintain and operate these facilities a complete new regime will have to be developed, not unlike that which is used in the oil industry, where operation and maintenance crews will live and work offshore for extended periods of time. Turbine technology will further develop - it is likely that 2-bladed turbines will re-emerge as an alternative (higher rotor speeds, lower torque, less tower top weight, easier installation and maintenance). Vertical axis turbines are also contemplated where electrical generators can be installed on the platforms instead of on top of high turbine towers, thus reducing CAPEX, installation and OPEX. The UK is not alone in its desire to explore its offshore wind resource. Europe expects that about 40-50% of its total wind power capacity will be installed offshore by 2020-2030. Keeping the electricity flowing throughout Europe under these conditions will be a challenging balancing act for key decision makers. New generating capacity will have to be installed in the UK and Europe to replace ageing equipment and to satisfy our ever increasing demand for electricity. It is estimated that between 520GW2 and 862GW3 of new capacity will have to be installed between 2005 and 2030 to replace the old, inefficient and mostly thermal power plants, as well as to accommodate the increase in demand for electricity. That ‘new capacity’ is expected to be close to the current total European installed capacity of 726GW4. Governments will need to provide a clear long-term direction for those who have the appetite to invest the vast amounts of money necessary to build this new capacity. They cannot afford to sit on the fence and revise policy every few years! A stable political climate is required to deliver investment in the newly required power stations. Europe’s binding target in regards to renewable energy is a step in the right direction. Climate change is a real issue. Sustainability is a real issue. Security and health and safety are real issues. Gas from abroad, oil from the Middle East or ‘clean’ coal are fuels that are not the flavour of the month for politicians and voters alike. Disasters in Harrisburg and Chernobyl are not quickly forgotten. So, renewable energy must be part of the short term answer. And the appeal of 100% sustainability will eventually provide the full answer. While there are those who do not want wind turbines to be installed ‘in their own backyard’, offshore solutions will have to be sought despite the significantly higher cost to generate electricity compared with wind energy produced on-shore5. Ultimately both onshore and offshore projects will need to contribute to our future energy supplies, as we try to balance the requirements of those who object to what they call the ‘visual cluttering of the countryside’ with the important climate change issues and associated costs of supply6. A further balancing act is required to ensure the integration of large scale wind power stations into the existing electricity networks. In order for electricity networks to perform in a stable manner, the ‘load’ (or demand) will have to be balanced with the amount of energy produced. The demand varies throughout the day and throughout the year, but in a generally predictable fashion. The combined power stations on the network will have to produce less power during the night to deliver stable operation of the network. During the summer season it can be assumed that air conditioning will increase the load on the network, resulting in higher power outputs of the system. This ‘balancing of the demand/production equation’ is vital. Embracing wind power as a clean and sustainable indigenous power source adds a further variable to the production/demand equation. Wind is a variable power source; however its variability in terms of power generation is smoothed by the geographic spread of wind power projects, as well as the spread in technology employed. The cost of additional conventional capacity to provide short-term balancing needs is not prohibitive and will further diminish as Europe-wide integration increases. However, without a full scale worldwide electricity network (GENI)7 it will be impossible to power the world fully with renewable power systems. So, the next best thing would be a balancing act between conventional generation, and in the first instance, large scale wind power projects. At the time this article was written, the cost of oil had reached US$120 a barrel. This trend will of course drive up the cost of electricity, and with it also that of renewable energy due to inherent economic ties. At present the cost of wind power projects is declining slowly as the demand for wind turbines increases. Wind power on balance, compared with other production methodologies, is more financially attractive to governments, investors and end users. Turbine cost per installed capacity is falling, particularly for the offshore projects where foundation and electrical infrastructure share equally about half the total project cost. Larger installed wind turbines do not require foundations that increase in cost proportionally with the size of the turbines. Economies of scale will reduce the price of future wind projects. Long term goals as set by the European Governments will provide a stable financing climate for renewable energy, necessary to fight climate change, and necessary to keep the energy production in line with our ever increasing demands in a sustainable manner.